I received an unsolicited copy of Deliver Magazine this week. I don’t get a lot of business mail in general, and, as a certified junk mail junkie, I look at everything. It took me more than a few seconds, however, to discern the focus of the publication (more on that below), but a quick browse of the articles led me to the conclusion I was looking at a publication about direct marketing in general, and direct mail in particular. The publisher? This took even more digging because, for what I’m sure was a very conscious, strategic reason (though what that reason is escapes me at present), they bury their brand completely. It’s the United States Postal Service. First, the good. It’s an informative read. Granted, I’m in the business, but even then, the articles are concise, well-written, and topical. I’m saving the magazine for a planned business trip later this week, but I am particularly looking forward to a case study in which a real estate developer sent a series of eight dimensional mailings to real estate brokers, culminating in (I kid you not) a Motorola cell phone with the developer’s phone number pre-programmed. (What I wouldn’t give for a budget like that.) There’s also a timely article on legislative proposals to institute a “do not mail” list alone the lines of the national “do not call” registry. Interesting stuff. Here’s what disappoints me, however. I’m not in the magazine publishing business, but even as a relative layman, the magazine is a marketing disaster. Let me count the ways. I don’t know why I received it. I don’t know why I should read it. I don’t know what the publisher wants me to do with it. I don’t know if this is the first issue of many that will grace my office mailbox, or the last. Nope. None of the above. In fact, there’s not one, single, identifiable call to action – the cornerstone of effective direct marketing – that accompanied the magazine. I don’t mind saying that my first instinct upon browsing the articles was: “Hey, I have some colleagues and clients who would enjoy this” but is there a bind-in or blow-in reply card that enables me to refer said colleagues? No siree. Nada. Huh? 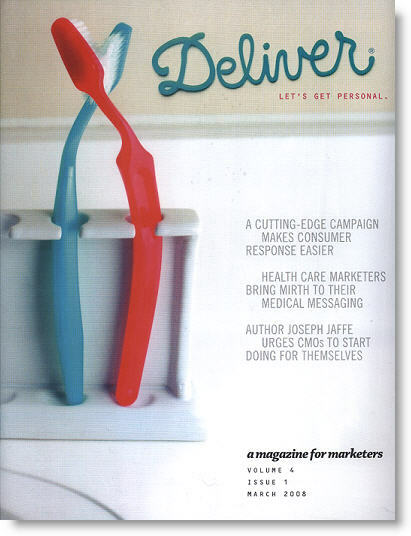 I looked in the table of contents for Jaffe’s byline, and discovered an enlightening, somewhat provocative essay on the value of “marketing conversation” – a process of building dialogue, and even disagreement, with your customers in forums such as blogs, podcasts, and Second Life. Where on earth do you get “doing for themselves”? Answer: you don’t. The cover blurb refers to Jaffe’s op-ed on Page 5, but that didn’t make the table of contents. Good grief. But I recommend you subscribe anyway. Hey, it’s the Postal Service. At least they’re trying. This entry was posted in Campaign Strategy, Copywriting, Creative, media, Offer Strategy on February 26, 2008 by Howard Sewell. Interesting take on the magazine, Howard. Even the Postal Service needs to market..albeit sometimes poorly. I did get some value out of my issue in the article “Do Not Mail”…about the momentum that the registries are getting. States where DNM legislation is introduced include Arkansas, Colorado, Connecticut, Hawaii, Maryland, Missouri, Montana, New York, North Carolina, Rhode Island, Texas, Vermont, and Washington. The USPS makes a lot of revenue each year with direct mail…and has a lot to lose if this legislation passes. Thanks for the input. Again, to be clear – I think the content of the magazine is terrific, and like you, I agree: the “do not mail” article looks very interesting. I was just taken aback by the appalling lack of direct marketing principles displayed in what was (for me) essentially a piece of direct mail. I literally don’t know if I’m a subscriber or not! Coming from the USPS, I just think is a gross oversight.